The Active Agile Most Noble of Friends. 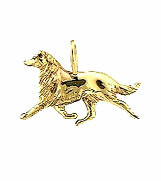 This pendant is of a Rough Collie ready to show. Collies have such a wealth of qualities. They are sensitive, sweet, kind, intelligent, energetic, courageous- the list goes on and on. When training Collies you must be gentle and loving, do the same for yourself. Reward yourself with a lovely pendant depicting the proud glide around the ring.